The trampoline is a rare outdoor gift that continues to thrive as others retire. It offers hours of entertainment for the entire family which not only aids in working off pent-up energy, but also helps in developing family social skills. For the overanxious mom and dad who fear for their nippers’ safety, manufacturers now have several innovative approaches to safety that ensure that no one gets hurt! 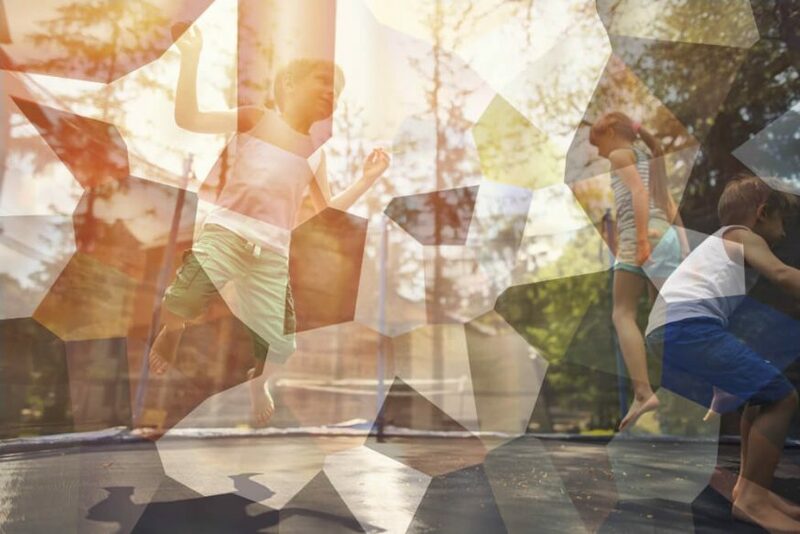 In the light of this, here are our picks of what we consider to be the Top 10 Best Safest Trampolines in 2019. Our top pick here is currently considered not only the world’s safest trampoline but the coolest too, and it’s not hard to see why. The main reason why we highly recommend the Springfree 13ft Jumbo is that it does not have those dangerous springs that are infamous for lacerations and sprained ankles. This design also eliminates the dreaded spaces along the edges that jumpers especially boys and men fear plunging through. It’s also fitted with a polypropylene (currently the best material) enclosure net called FlexiNet. This net has been crafted to cave inwards to retain the jumpers and protect them from hitting the support poles, and it’s UV-treated to offer years of durability in the sun. The mat itself is engineered to withstand up to 220 pounds of jumper weight and 5,000 hours of direct sun exposure. The steel frames, on the other hand, have been powder-coated for magnificent durability and can have a load capacity of 1100lbs. Basically, the construction design of this trampoline means that it’s usable by several kids at a go or an adult and it can be safely left out all year long. Note that while this is a 13ft square trampoline with 155sq. feet of usable jumping area, the fact that the mat is connected to the net makes it equivalent to most 16ft round trampolines. But it’s also available in 11×11, 8×13 (oval), 8×11 (oval), and 10ft (round) sizes and shapes. Some of the nice-to-have accessories that double the fun include a sturdy basketball hoop, a ladder, and the ability to connect to tgoma- Springfree’s patented fitness app for both adults and kids. Skywalker is a name to reckon with in the trampoline industry, and what we like about them is their ability to enhance the overall safety of the jumper without taking their price tags through the roof. If you are looking for an affordable alternative to the Springless Trampoline 13ft Jumbo above, we can confidently recommend this one. The Skywalker Jump N’ Dunk 15ft is a spring-based trampoline engineered to withstand up to 200 pounds of jumper weight. Uniquely, this model does not suffer the safety hazards that plague conventional models. Similar to our top pick above, this bouncer has a patented no-gap enclosure design that is achieved by attaching the net directly to the mat and taking the springs outside the jumping zone. Worth mentioning, the net is supported upright by heavily padded steel posts that have been curved outwards to keep the jumper out of harm’s way. This trampoline actually gets its name from the basketball hoop on board and it’s available in a variety of colors to suit your family’s needs. While what we are reviewing here is the 15ft model, you can also get it in 12ft and 8ft sizes. One great feature that gives JumpSport AlleyOOP the upper hand in terms of performance is its Patented VariableBounce Technology. Let not this term confuse you: simply put, this is a performance enhancement technology that involves a system of springs some of which engage immediately the jumper lands on the mat while others engage a split second later. The essence here is to allow the jumper to absorb the shock gradually rather than abruptly, and this puts less stress on the bones. Notably, this spring system also tends to give the JumpSport AlleyOOP quite a good bounce than most of the trampolines that we came across, and that’s exactly what trampoline enthusiasts want. The JumpSport AlleyOOP is several folds pricier than the Skywalker Jump N’ Dunk above, but the quality of materials used for this model explains why. For one thing, while this is a 12ft bouncer, it offers a jumper weight capacity of 240lbs which is significantly higher than what the 15ft Skywalker offers. This trampoline is crafted with high-quality materials including pre-galvanized steel frames, 96 black extra-stretch springs, and a UV-treated Permatron jumping mat with 10 rows of stitching that make for a high-performance and element-resistant jumping mat. We are also great fans of the deal that this manufacturer offers in terms of warranty: you get 10 years for the jumping mat and net, 5 years for the springs, 2 years for the spring pads, and 1 year for all other parts. The inconspicuous Zupapa is yet another great option for homeowners who are in the market for a top rated safety trampoline with enclosure. This model is available in 12ft, 14ft, and 15ft sizes all of which offer the highest maximum weight capacities that we’ve seen so far. For instance, the 15ft model which happens to be the largest offers an amazing 375 pounds of jumper weight capacity, while the 12ft and 14ft have a capacity of 330 pounds each. Honestly, none of the trampolines that we’ve reviewed so far comes any closer to these figures. These high weight capacities mean that you can confidently take a spin on these trampolines without the fear of plunging through the mat. Similar to the Skywalker Jump N’ Dunk, the padded spring system in this model is also located outside the jumping surface thereby eliminating the risk of trapped and injured limbs and backs. Another thing that boosts this bouncers’ rank in most lists of the safest trampolines on the market is its TUV Approved status. If you’re curious, TUV (Technical Inspection Association) is a Germany-based consultant group that tests the safety of products including amusement rides and electrical appliances. But what’s even more impressive is that you won’t have to buy a ladder and a rain cover separately since these too are included in the package. The SkyBound Stratos is slowly unseating the SkyBound Cirrus trampoline- another reliable model from this manufacturer that holds a lot of sway in the market. But what makes the Stratos a reliable investment for you? We would say a lot of things that can only be covered in 2 words: Quality and Safety. While most middle-price bouncers top out at 200 pounds in terms of weight capacity, the Stratos maxes out at an amazing 330 pounds! This is a sure pass for multiple children to climb onto the trampoline with guaranteed safety. This high weight capacity also means that you can climb on and give your nippers some lessons on how to jump on a trampoline safely. Available in sizes 15ft, 14ft, and 12ft, this trampoline is supported by 6 W-shaped legs that never dig into the ground. On the same note, this steel frame has been powder-coated black to curb the issues of early rusting and corrosion that come with using bouncers in wet and humid environments. But what we like most is that its concave-designed net enclosure is held in place by 12 poles. Mind you, most trampolines with enclosures come with utmost 6 poles, and that’s what gives the Stratos its competitive edge. SkyBound didn’t stop at the poles though. They went ahead to give the enclosure system a gapless design thereby eliminating the potential risks of the jumpers falling through or cutting their fingers and feet on the springs. Is installation difficult? Nay. The SkyBound Stratos not only comes with easy-to-read instructions, but it has also been designed to install in under an hour. We would only recommend this bouncer only if you are really strapped for cash but you still want a trampoline with a safety enclosure. The reason for this is that unlike in the slightly pricier models, this bouncer’s net is fitted outside the edge. This means that, although the springs are padded, they still remain a threat to the jumpers’ safety. That notwithstanding, we feel that this trampoline has your family’s safety in mind on other fronts. The best part about round trampolines is that they tend to pull the jumper towards the center more so if more springs are used. The Kangaroo Hoppers features 90 stainless steel springs that pull the 15ft jumping mat in synergy to keep you from the edges. This mat also offers an enormous jumping zone. In addition, we appreciate that this trampoline has 5 pairs of unique curvy legs for stability and 10 sturdy plastic posts that hold the enclosure system upright. This unit also does come with a ladder to prevent your children from jumping off the bouncer. This is to say that safety is guaranteed especially if you follow the 1-jumper-at-a-time safety rule and back it with parental supervision. Durability is yet another factor that we’ve come to like about this trampoline. First and foremost, we like that the mat has been crafted from Polypropylene and it’s UV-treated for durability. The Polyethylene netting is also UV-treated so you won’t have to replace it after only a few uses. The galvanized steel frames also feature a corrosion resistant powder coating that again takes durability a notch higher. Honestly, what else could you ask for at this price tag? Buyers around the world continue to connect quality, durability, and reliability with German products- a trend that has existed for over 110 years. Boasting a German origin, Songmics is among the most celebrated brands in trampolines space, of course, because of the seriousness with which it takes your kids’ safety and fun needs. If you are looking for an affordable outdoor trampoline with basketball hoop, trust us- this one has got you covered. This model is available in 3 sizes; 12ft, 14ft, and 15ft and you can also get it without the hoop if you don’t find it necessary. Regardless of your choice, your trampoline will sport the features that we’ll list here. This model features 6 ‘W’ shaped legs each with 2 contact points that make it even more stable than the Kangaroo Hoppers above. The steel frames have been fully galvanized for years of durability besides giving them a good appeal. The most interesting bit about this trampoline, however, is the 375 weight limit– it’s German, remember? Usually, such a high weight capacity will allow a couple of children to hop onto the mat at a go or an adult plus 2 kids. To eliminate all your doubts appertaining safety, the jumping mat is a Polypropylene that has been high- pressure tested to pass TUV’s safety and durability requirements. On the same note, this mat is held in place by 96 galvanized springs that give it a good amount of bounce as most buyers affirm. Still, on the subject of safety, the net enclosure is actually connected to the mat to get the padded springs out of the way. This net again has a concave craftsmanship that further directs the jumper towards the center and away from the springs in case of a mis-jump. To add to the already impressive design, the net is a dense mesh that gets a nice pull from the nicely padded and tight rails. And you also get a nicely welded 3–step ladder to make getting in and out of the trampoline much safer. The Skywalker Rectangle 15ft with a 250-pound weight limit is a big bro to the Jump N’ Dunk that we saw earlier on, and a perfect trampoline for gymnasts, athletes, and dabblers alike. Rectangular bouncers aren’t so common but they are there. These models make the best trampolines for large families with quite a good number of serious jumpers for a couple of reasons. Most importantly, rectangles tend to offer a larger jumping surface area for multiple jumpers to practice maneuvers with reduced risk of collisions. In addition, these models are renowned for creating a far much better bounce than their square, round, and oval alternatives. But the main reason why rectangles make the best trampolines for people in gymnastics is that their springs work independently thereby giving the jumpers maximum control over their takeoffs and landings anywhere around the mat. True to Skywalker’s culture, the springs (76 to be precise) are padded and outside the net to create this brand’s patented no-gap enclosure system. This means that no matter how close they fall near the edge, your children will never land or even injure themselves on the springs. This beast again has a super strong structural base that should never go unnoticed. It boasts 4 very thick legs and galvanized steel frame that work together to create a super sturdy bouncer for the most aggressive jumpers. To add on to this, this trampoline is fitted with reinforced T-sockets that further boost stability and prevent structural twisting. Sportspower- a Hong Kong-based leisure tools company- is making a really good name for itself with its bouncers. My First trampoline is among their best-selling models and our most recommendable unit for moms and dads looking for the safest outdoor trampolines for kids. This bouncer has a diameter of 84 inches and covers almost everything that kids’ trampoline should include, in our opinion. To begin with, this single-kid trampoline is rated at 100 pounds (approx 45kg) in terms of maximum weight capacity- a limit that most children probably won’t surpass. But then again, you can never be too cautious with your little one’s safety. Mind you, we’ve heard of 130+ pounds moms who’ve taken a ride on it. While we don’t advise you to confirm their claims, this should give you a clearer picture of how strong this trampoline is for your kids. My First Trampoline is also low to the ground and most 3-year-olds should be able to climb by themselves with no need for a ladder. The springs and the netting support poles are also heavily padded to prevent injured fingers and legs, and the net (with a zipper) is dense enough to retain the jumper inside. Sure, installation is easy and can be done solo in about 1 hour or so, but you should expect it to get a little tough especially if you don’t know how to put the last springs in a trampoline. The manufacturer claims that this beauty is resistant to both rain and safe. To be on the safer side though, we recommend setting it up under a shade or getting a canopy. Our last recommendation here is from Skytric- an American manufacturer that has made a really good home run with its trampolines in the recent past, and a sister brand to Upper Bounce. This model is available in a range of sizes ranging from 8ft to 15ft although all of them have been engineered with the same blueprint. This trampoline is getting a good press, firstly because of its gapless design that eliminates the risk of falling through or hairs and fingers getting trapped in the springs. To give this trampoline its 330-pound maximum weight capacity, Skytric has crafted a really strong mat from Polypropylene with 8 rows of stitching to make it resistant to abrasions and tears. This mat is again held in place by 96 galvanized steel springs that create both strength and a good rebound. This trampoline again has 6 pairs of legs with a total of 12 contact points to keep it stable on the ground. On the same note, we really love the way the enclosure system poles connect directly to the legs. Besides making the installation process simple, we feel that centralizing the joints in one place rather than all around the edge minimizes the development of weak points. Touching further on its installation, this trampoline is designed to assemble and disassemble without a lot of hassles although several buyers say that they faced a few hiccups at first. Trampoline safety is a broad topic that involves understanding how trampoline accidents happen, and what measures the manufacturers put in place to avert these occurrences. Just as in our old good days, most trampoline accidents today emanate from being thrown out of the jumping mat onto hard surfaces, bikes, and onlookers. To remedy this, modern manufacturing has now introduced netted enclosures that keep the jumper inside, and we really recommend you to consider a trampoline with it. When we say a safety net, we mean a high-quality one preferably made from Polypropylene. Polyethylene and Polyester nets do offer an economical alternative for buyers on a budget, but they are rigid and more prone to ripping and letting the flying kid out with time. As good as these safety nets are, the poles that suspend them do pose a hazard as they can cause injuries when hit at speed. And that’s why we recommend an enclosure system with enough padding on the supportive posts and a net that pulls towards the center of the jumping surface to keep the jumper off the poles. The springs in traditional trampolines are guilty of scratching and pinching the young jumpers’ backs, snapped ankles, and strangulations- too much for a toy! To solve this issue, you’ll want to ensure that your target trampoline has a strong and reliable safety padding to protect the jumper from the springs and metal frame. The padded section should also sport a contrasting color to that of the mat to help define the edges clearly. Unfortunately, our search for the safest backyard trampoline 2018 revealed that this padding doesn’t always guarantee safety. As an average buyer, you might also not be able to tell the quality and reliability of the padding more so if you are shopping online. Perhaps the safest bet would be to avoid the spring-based trampolines altogether in favor of the latest springless models. But wait, are Springfree trampolines really safer? Are they even bouncy? Read on. The dawn of Springfree trampolines seems to have solved almost 50% of the safety issues that continue to plague conventional spring-based trampolines. And Dr. Keith Alexander, the inventor of Springfree Trampolines is the guy to take all the credit here. These latest offerings don’t rely on springs to connect the mat to the frame for tension. Instead, they use bendy fiberglass rods that connect to the edge and beneath the jumping surface. Speaking to Forbes, Dr. Alexander says that this invention keeps the jumpers out of harm’s way by eliminating all the gaps that kids tend to plunge through, and keeping the metallic frame well beneath the mat to avoid contact. Amazingly, most of the best and safest springless trampolines that we’ve come across don’t seem to compromise bounce for safety. So you can now have a good bounce without the fear of lacerations and scratched backs. Note that these additional safety designs mean that you’ll have to pay top dollar for the trampoline. But parents who have had an encounter with trampoline-related injuries will tell you that these bouncers are worth every single penny. Right off the bat, a trampoline will never be too large especially if you have a family of jumpers including dad. But then again, getting the right size trampoline for your family depends on several factors including the amount of space available in your backyard, the number of people that will be jumping at the same time and their age and weight. Size and shape go bumper-to-bumper when buying a trampoline. These outdoor fun accessories may take a number of shapes with round, rectangle, and square trampolines being the most common. But you’ll also see some ovals and octagons. We recommend you to consider your yard’s shape and size first before committing to a certain bouncer. When determining the right size, keep in mind that trampolines are measured by frame length and not the size of the jumping mat. This is to say that circular trampolines are measured in terms of diameter while rectangles and squares are measured in length and width. Round trampolines are usually the most common since they fit in most yards and they are also the least expensive. If you don’t have a large backyard or a high budget, circular trampolines measuring 8-10 ft and the rectangular models measuring 7×10 ft and 8 ft might suit you. If you are hunting for the best trampolines for 2 people or more, you’ll want to consider 12-15 ft round trampolines and rectangular models that measure 12 ft and above. The last feature that you’ll need to figure out is in fact, the most important here: weight limit. The weight limit of a trampoline refers to the maximum weight that a given model can hold safely during normal use. For instance, the Skywalker Trampolines 15-feet jump n’ dunk trampoline with safety enclosure has a weight limit of 200 pounds. This is to say that safety is only guaranteed if the weight of the jumper (or jumpers) does not exceed this mark. Or put in a simpler way, this trampoline is safe for 2 teens with a total weight of, say, 180 pounds, but not safe for an adult who weighs 220 pounds. It’s simple to comprehend, right? But is it safe to trust trampoline weight limits? Trusting the weight limit of a trampoline involves understanding how these limits are actually determined, and getting feedback from first-time users. The safest trampoline brands use ASTM’s (American Society for Testing and Materials) guidelines to determine the maximum capacity that their bouncers can hold. Basically, for a trampoline to pass the ASTM test, it should be able to support 4 times its stated weight limited for at least 5 minutes without the mat, spring, and frames breaking or showing any signs of deformation. However, the fact that these units can actually withstand up to 4 times their weight does not allow you to let all your kids take a spin on the bounce all at once. If anything, we, as well as most manufacturers, don’t recommend 2 jumpers to get on to the trampoline together. Why? As Dr. Wray, a pediatric Neurosurgeon tells abc.net, while netting enclosures have minimized the risk of flying off the bouncer to a greater extent; injuries emanating from all sorts of collisions when 2 or more people get on the trampoline together are on the rise. This is to say that there should never be more than one jumper at a time. We know that this is the hardest rule to comply with because, well, trampolining is fun when you have your friends on board. All in all, it’s good that we mentioned it. Children love bouncers, and so do parents! These fun tools offer a great cardiovascular workout to adults and teenagers and also help kids to develop motor skills, flexibility, and self-esteem among other benefits. As a recap, remember that the safest trampolines on the market are the ones that feature a no-gap design and has a flexible netting enclosure with an opening that can be zipped up and down from either side. Lastly, as you may have realized from the reviews, manufacturing technology has really changed and top-rated spring-based trampolines are now as safe as the newest Springfree hybrids. And that means that there is always a safe trampoline for your home at every price point.